In the wake of our recent can-o-poluza, I realized that we had some dehydrated tomatoes leftover from last year that needed to get used up. I had planned to use them in place of oil-packed tomatoes, but just never got around to it. 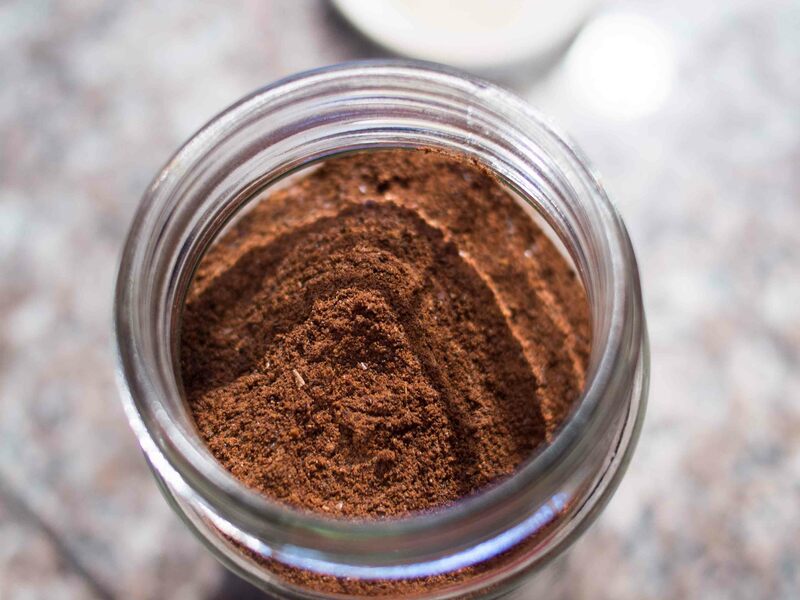 In the past I’ve turned dried mushrooms into mushroom powder and used it to add a little meaty, umaminess to dishes. Maybe tomato powder would work the same way? 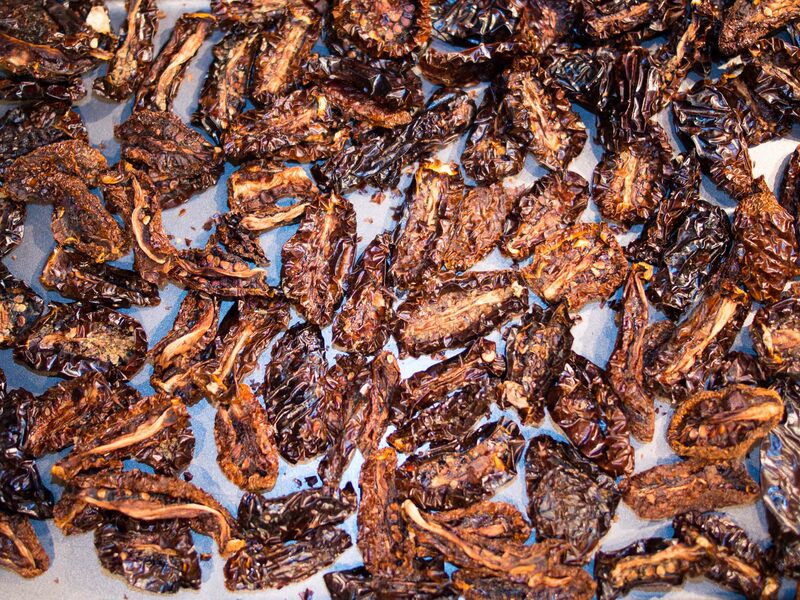 I had 8 ounces of dried tomato halves (enough to comfortably cover a 9×13 baking sheet). This is the end result of dehydrating 5 pounds of roma tomatoes (about 40 tomatoes). They had been sealed in a zip-top bag, but had picked up a little moisture since I put them away, so I laid them out on a pan and let them dry in a 170°F degree oven for an hour. I removed them from the oven and let cool for another 30 minutes. By now they were very crisp and would break, rather than bend. Now it’s time for a trip in the blender. 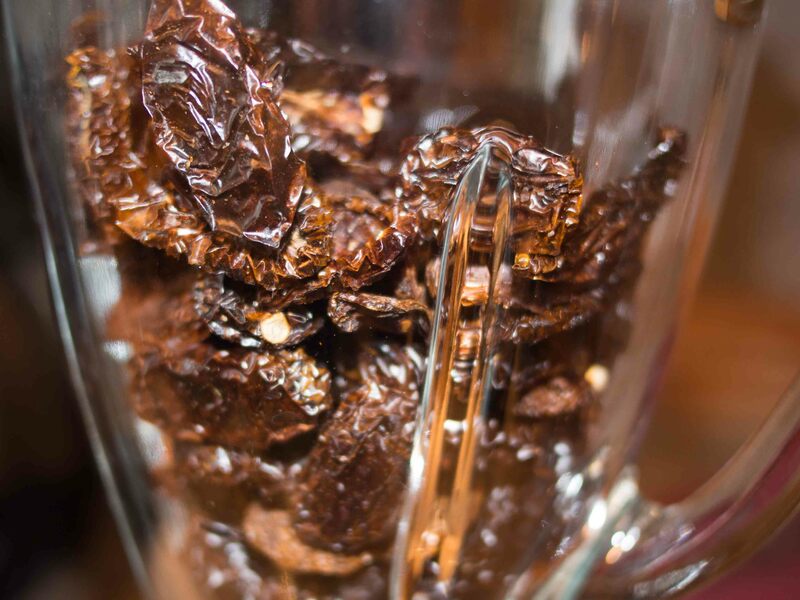 I loaded the dried tomatoes into the blender with a food processor attachment. I pulsed them a half-dozen times until most of the tomatoes had broken down into chunks. Then I blended them on low for about 30 seconds. By now, it was mostly a very fine red powder with a few larger bits. A couple more pulses and took care of those. Note – let your blender sit a bit at this point before taking the lid off so you don’t get a face full of tomato dust. I ended up with a little over a cup of fine red powder and it tastes just like summer – bright and sweet. It has nice, deep, concentrated tomato flavor. I’ve seen places that sell tomato powder where the idea is to rehydrate it into paste or sauce. But I think it would be much better as a way to add that fresh tomato taste as an accent – more like a spice. I’ve already tried a teaspoon or so in stew and it really bumped up the flavor and deepened that taste. And it’s a whole lot easier that opening a can of paste. Great idea! Love the idea of using it instead of tomato paste. I was going to say the exact same thing as Lea Ann…so ditto! Excellent secret ingredient! I am REALLY interested to hear how this turns out. This would be good for adding color in smoked chicken too, I think.